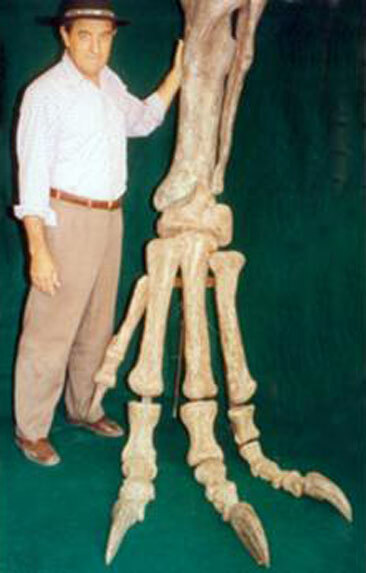 Rubén Carolini, the discoverer of the largest carnivorous dinosaur - El Chocón, Patagonia, Argentina. One of the most important fossil discoveries in the world was made by Rubén Darío Carolini, a paleontologist by adoption who discovered the largest carnivorous dinosaur in the world. The province of Neuquén performed a tribute as a way of thanks to his great contribution to historical and cultural heritage of the province on May 14, 2009. Rubén Carolini dimensioning the size of the dinosaur. Carolini Ruben Darío was born in the town of Oncativo in Córdoba in 1944. He lived there until age of eleven, where he went to school until fifth grade and then abandoned for financial reasons. His father taught him the trade of mechanic to which he dedicated for many years. At age 23, he came to Cipolletti, where in 1970 he married Graciela Belleggia, with whom he has two daughters. Between 1969 and 1974 he worked as Head of Maintenance of large trucks in the dam "El Chocón", then he started working on Hidronor until 1993 that it was privatized. Since 1988, Carolini discovers and begins to explore one of his passions: the search for fossils. On July 25, 1993, Ruben discovers the fossilized remains of what it would become the world's largest dinosaur. Since then, paleontologists Leonardo Salgado, Jorge Calvo Rodolfo Coria, with Carolini form a rescue team, recovering nearly 70% of the dinosaur's bone structure, giving it greater value to the discovery. In 1995, the scientific journal "Nature" reports the discovery of "Giganotosaurus Carolini", the largest carnivorous dinosaur found, recognizing it even larger than the famous Tyrannosaurus Rex. That same year, the Paleontology Museum of El Chocón was municipalized and he was named as the director, a position that he holds to date. With 66 years and nearing retirement, Rubén continues to work from his experience, raising awareness about the preservation of our planet. The discovery of Carolini, maximized the development of the scientific activity of paleontology in the area. Discipline, linked to the museums, has contributed greatly to the development of tourism profile in the province both nationally and internationally. The tribute act included the projection of a video tribute, going from the life of Rubén Darío Carolini, and the presentation of a protocolar plaque in recognition of the contribution of his discoveries and his work for the heritage and environment of the people of Neuquén. The figure Carolini gained international renown as the discoverer of the largest carnivorous dinosaur in the world, and it put the region in the foreground, showing its palaeontological's riches. Giant's land Villa El Chocón is known for the "Valley of the Dinosaurs", declared a national historic site in 1997. Here were made important discoveries that stands between the largest carnivorous dinosaur of all time. El Chocón Hydroelectric Complex The hydroelectric plant of El Chocón is located at the northern end of the artificial lake Exequiel Ramos Mexía. The dam was built for the purpose of flood control of rivers, reduce the effects of prolonged downspouts, increase the areas under irrigation and generate electricity. Lake Ramos Mexía of El Chocón The artificial lake Exequiel Ramos Mexía is the largest in Argentina, there it can be practiced fishing as well as various water sports like boating. Aldo Beroisa: an artist dedicated to bringing us the dinosaurs Aldo Beroisa is a cartoonist and sculptor of El Chocón that is responsible for making the models and drawings of dinosaurs from the local museum. Different circuits in El Chocón El Chocón offers several circuits that have fabulous sceneries, geological and paleontological attractions. Villa El Chocón Museum The Paleontological Museum of El Chocón has the fossil remains of the largest carnivorous dinosaur in the world. Escondido Canyon in El Chocón 3 kilometers from El Chocón it is the Escondido Canyon, a canyon where you can learn more about the past in these lands and that inside it you can see dinosaur footprints in different positions.